" The more testosterone you produce, the less likely you're gonna enjoy sitting through Racing Stripes. " Tagline: His stripes made him an outcast. His heart made him a hero. An abandoned zebra (the annoying voice of Frankie Muniz) grows up believing he is a racehorse. His animal friends (who can also talk) do nothing but perpetuate the poor zebra's delusion and encourage him to go after his dream of racing with thoroughbreds. What will happen when he finds out that he's not actually a racehorse? Will he keep fighting against impossible odds to achieve his dream? Or will he live out the rest of his days in a petting zoo? Yet another sap-oozin' movie with talking animals ensues. There’s a movie principle that states, and I quote, “When it comes to movies that focus on talking animals, there’s a fine line of demarcation separating moviegoers.” The fact that I just now created that movie principle doesn’t make it any less true. 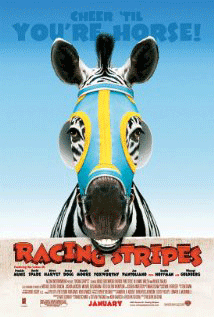 There just aren’t that many people walking that fine line who are thinking, “You know, I’ve hated every single talking animal movie I’ve seen, but maybe Racing Stripes will be THE one to win me over.” It just doesn’t happen. And that’s fine. Racing Stripes isn’t trying to appeal to everybody. So in all fairness, it’ll sit quite well with its target audience – young children, women (particularly mothers), and anybody who just absolutely can’t get enough cheesy, sappy, follow-your-heart movies. However, the more testosterone you produce, the less likely you’re gonna enjoy sitting through this. Let this be a warning to dad – this is one for mama to watch with the kids while you excuse yourself to the man cave. To be completely honest, I knew going in that I probably wouldn’t care for the movie. I remember watching the trailer with a stone face, never cracking a smile. I hoped it’d exceed my expectations, but in reality, there’s only about a 2% chance that I could possibly like a movie whose poster contains the phrase “Cheer ’til you’re horse.” That’s just wrong. But hey, I watched the movie; therefore, I’m now exercising my right to poke a little fun at it. I was rooting for the zebra to lose. I know, I know. I’m cold-hearted. I have no feelings. This is an assault on the true American spirit that resides in the hearts of underdogs everywhere. Go ahead; get it out of your system. Scream at your monitor if you must. There, feel better? Now let me explain. The zebra cheats. Plain and simple. During the race, the flies (voiced by David Spade and Steve Harvey) relay advice and information to him from a horse that helped train him, telling him what he needs to do to win. Not only that, but they also bite another racehorse, causing him to falter and fall out of the race. What kind of message does this send the kids? If you don’t have the talent to compete, then get some friends to help you cheat? The daughter gets away with rebellion. In one scene she’s mad at her father for not letting her have her way all the time, so she gets out of his truck and rides the zebra home. The father tells her not to do it, but she ignores him and takes off. The consequences of her disobedient actions? She gets what she wants. Great message there. Where’s the discipline? Frankie Muniz is the voice of the zebra, and as a rule I always root against Frankie Muniz. Call me overly critical if you want, but if you look at my points with an honest, discerning eye, then you’ll realize they’re reasonable. Next time you try to discipline your child for disobeying you, and your child calls you a hypocrite because you giggled at it in Racing Stripes then remember what I said. As for how much entertainment value I got from the movie, well, I kept note, and it took a good 45 minutes (when the flies make their first appearance) for my first laugh to arrive. Actually, there really wasn’t much “good” about those 45 minutes, but I digress. The movie had managed to pry a couple of reluctant smiles from me a couple of times before that, but that’s about it. Oh, and somebody please tell me, how many flatulence and poop jokes can one kid’s movie have? Sheesh. Is that the only thing kids laugh at these days? Racing Stripes seems to think so. That fly just broke wind in that guy’s Espresso! HAHAHAHA! That bird just pooped on a horse! HAHAHAHA! Look, another animal just ripped one! GUFFAW! GUFFAW! Goodness. I will give Racing Stripes credit for being family friendly. This is pretty harmless stuff, so if you are just a sucker for talking animals then have a blast. But if you’re like me, and your gag reflex strongly kicks in whenever you hear Bryan Adams start singing about how “It Ain’t Over Yet” then this might not be the movie for you. My main shock is that Enrique Iglesias’ Hero wasn’t used. It would’ve fit in perfectly. Rated PG for mild crude humor and some language, Racing Stripes is pretty safe for the whole family. However, there is an overabundance of flatulence and poop jokes.